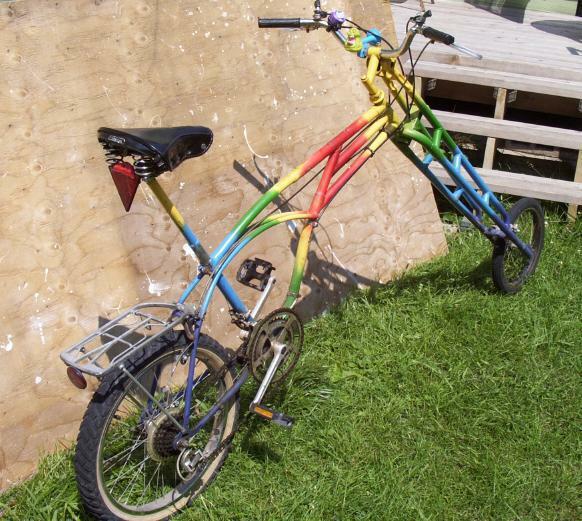 This bike is just too silly for words! (but I'll write about it anyway...) It is as long as my recumbent, but much less practical, though just as much fun in its own twisted way. 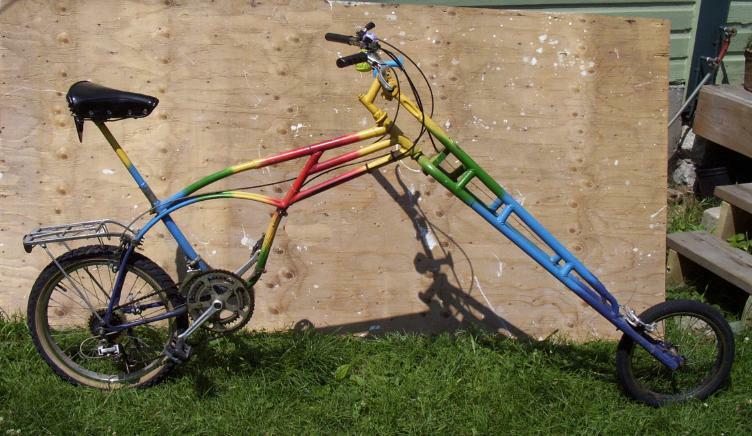 Mike Watson is a local bike nut who loves to build all sorts of weird and wonderful human powered vehicles, and is the creator of this slightly bizarre machine. 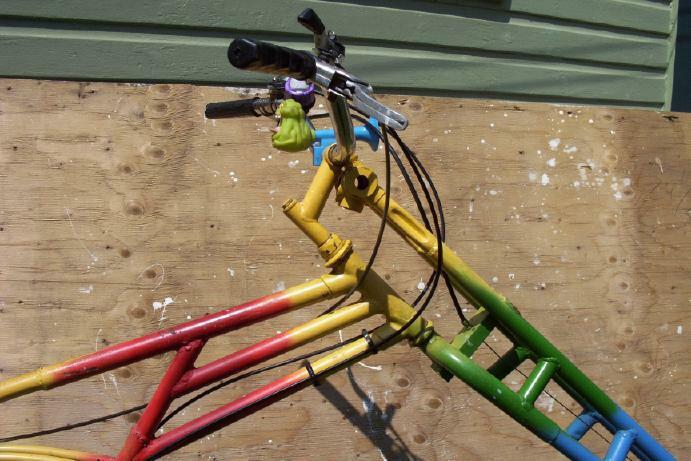 He has made tall bikes (including a tandem! ), choppers, shopping cart trikes, you name it, he has probably built it or at least thought about it! You can see a few examples of his machines at the HPVOoO site. Mike is also an editor for the online publication BikeRod'nKustom. You can check out some of Mike's pages (from the same site) via this link (warning, many images and slow to load). Riding this bike is actually a lot of fun, and it often gets even more attention that my recumbent! Now of course that rather extreme head tube angle results in a fair amount of fork flop, and the weight of the ladder fork exacerbates this as well. But one just has to take it easy and keep a firm rein on the bike. If you lean forward and put too much weight on the front end the thing just gets more squirrely. But if you sit back on the seat and just get into that zen-like state of chopper bliss, then all is well and the secrets of the universe are revealed (wait a minute, I've heard this said about fixed-gear bikes as well, so one of us is exaggerating!). One thing that cannot be achieved with this design is proper leg extension! Due to the rather unsual geometry, when I get the seat to a height where I can still just get my toes on the ground, once on the pedals my legs still have more of a bend in them than I'd like for comfy riding. But hey, with these sorts of machines you have to mold yourselves to them somewhat, and Ijust look at it as a small price to pay for a different kind cycling fun. This bike is safe to ride on city streets, but I don't go *too* fast on it, as its handling in emergency manouveres is of course a bit suspect. But I ride it to the shop every now and then, and it is of course my first choice for any HPVOoO event. My motto? Everyone should have a Parade Bike! Copyright 2007 by Mark Rehder; Ottawa, Ontario, Canada.